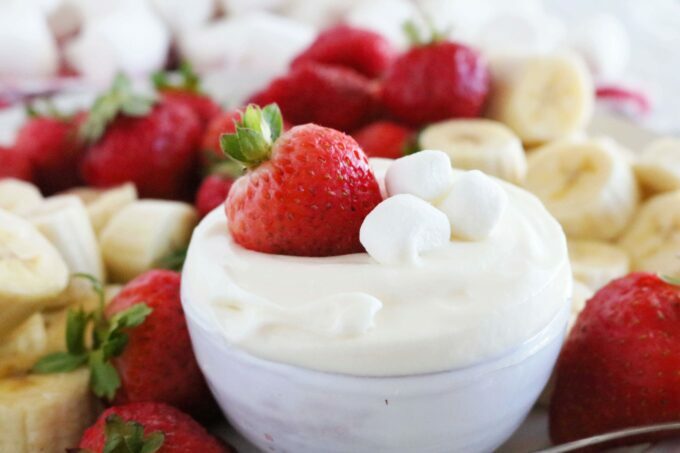 Let’s face it: Fruit is just better when there are marshmallows involved, and if your fruit tray needs a little sprucing up for any upcoming festivities, this Marshmallow Fruit Dip is exactly what you need. It’s creamy, light and fluffy, but best of all, consists of only 3 ingredients and comes together in about 3 minutes flat. 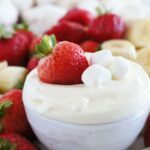 WHAT’S IN MARSHMALLOW FRUIT DIP? Marshmallow fluff tastes identical to marshmallows and is also light and fluffy in texture. Unlike marshmallows, fluff is a little closer to a liquid than a solid, making it perfect for incorporating into dips! However, it is sweet. Like, one dimensional, no other flavor components going on…sweet. This is where the cream cheese comes in. Cream cheese is wonderful for adding both flavor and body to fruit dips. Tangy with a thick and creamy texture, it is just what Marshmallow Fruit Dip needs to level out the sweetness from the fluff. 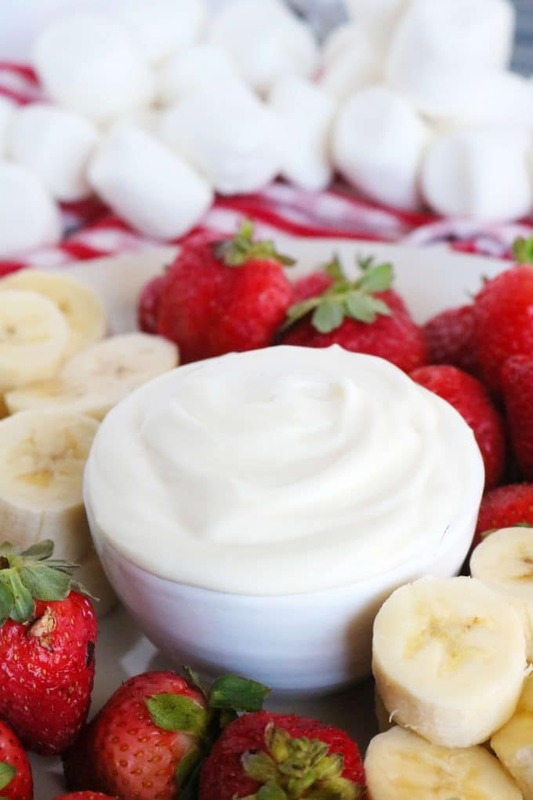 In addition to the cream cheese and fluff, vanilla yogurt contributes a smooth creaminess to the dip, gives it a lovely satiny sheen, and even a little extra vanilla flavor, making for one silky-smooth and seriously luxurious bite. 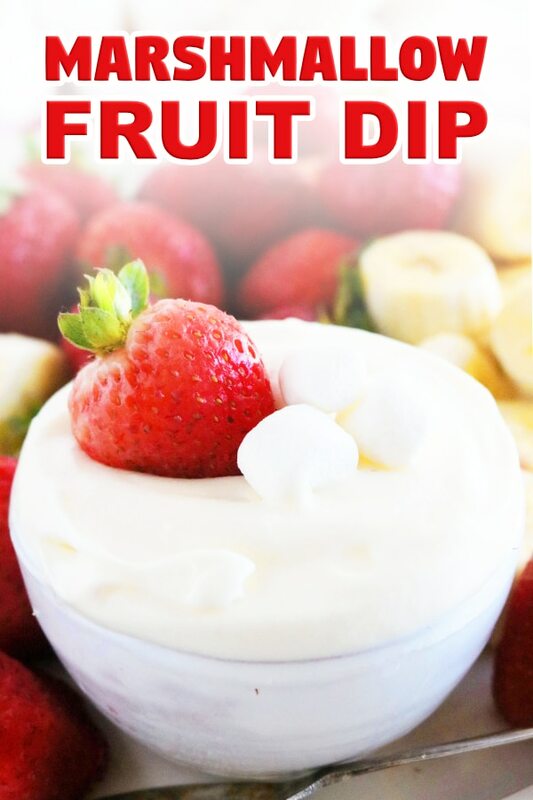 Marshmallow Fruit Dip is crazy easy to make. There’s little-to-no measuring, and it is as simple as adding a few ingredients to a bowl and turning on your mixer. Combine fluff, cream cheese, vanilla yogurt and salt in a bowl. 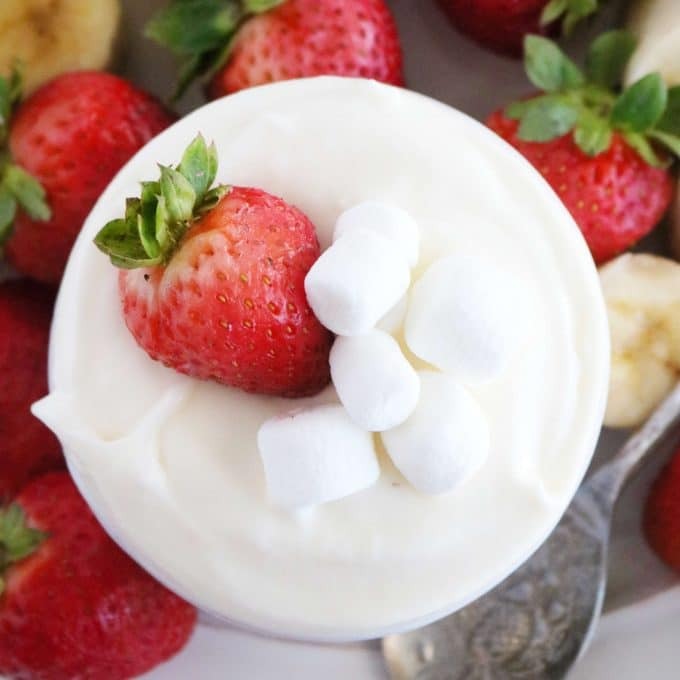 For perfectly smooth Marshmallow Fruit Dip, you’ll want to make sure your cream cheese is at room temperature before mixing. Cream cheese typically comes to room temperature within a couple of hours on the countertop. However, if you forget to put it out, you can place the cream cheese on a microwave safe dish and microwave at 10-second intervals, turning the stick over after each interval. Be sure to remove it from the microwave as soon as it starts to feel like it’s hit room temperature. If your cream cheese is good to go, simply add it to the mixing bowl along with the fluff, vanilla yogurt, and a sprinkle of salt. Then, mix to combine. 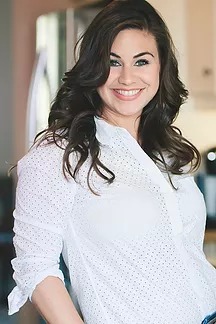 You can use either a stand mixer, a handheld mixer or a whisk to combine your ingredients. The whisk would likely make for a messy job, but if it’s all you’ve got, don’t let it detour you from making this delicious Marshmallow Fruit Dip! You can serve Marshmallow Fruit Dip as soon as it comes out of the mixing bowl, but giving it 1-2 hours of chill time in the refrigerator will definitely improve upon the texture of the dip. Plus, it is especially scrumptious next to fruit served cold. You want it to be “dippable,” so tiny fruits (e.g. blueberries) might not be the best option. Consider how quickly the fruit will start to brown. Apples, pears, and bananas are notorious for browning quickly on a fruit platter. So, if you do not expect your goodies to be gobbled up fast, maybe try some other fruit options to serve alongside your Marshmallow Fruit Dip. And lastly, avoid fruits with a high water content like watermelon, peaches, plums, and the like. TIP: If you’d like to use apple slices or pears for your fruit tray, fill a bowl with ice-cold water and squeeze the juice of a lemon into it. Then, soak the slices in the water for 5-10 minutes, remove the bowl and pat dry before transferring to your platter. This will help prevent them from browning too quickly. Raspberry Cream Cheese Fruit Dip is an easy dip made with raspberry preserves, greek yogurt, and lemon. Sweet, just a little tangy, and absolutely perfect for dipping! Creamy Lemon Cheesecake Fruit Dip comes together fast and features cream cheese swirled in with lemon curd. Perfect for parties, showers, and brunches! Cherry Cheesecake Dip is an easy, no-bake cheesecake dessert with a cream cheese base and canned cherry pie filling on top. It is addictively delicious and sure to keep guests coming back for more! Caramel Apple Dip is made with salted caramel and chocolate toffee. This one is a must-have for the hostess’s recipe arsenal. Baked Brie with Jam and Honey is an elegant and simple appetizer featuring baked brie with jam, honey, and almonds. Try it with strawberry, apricot or raspberry jam! 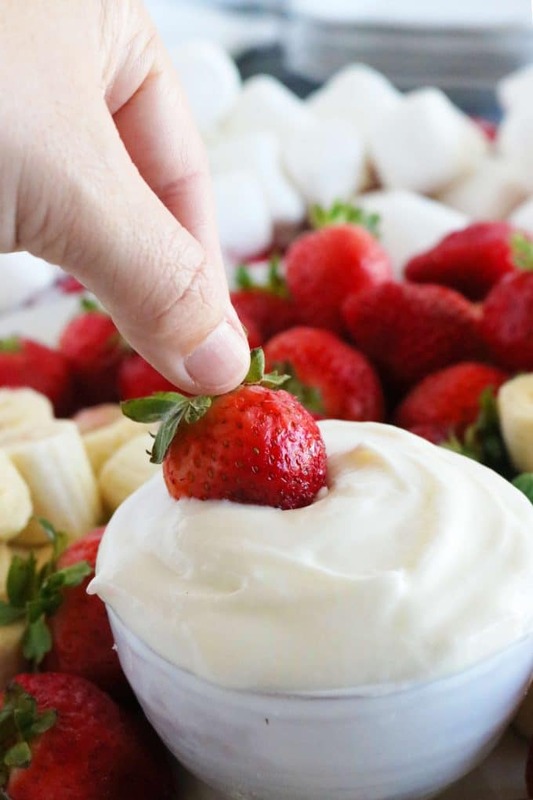 Marshmallow Fruit Dip with cream cheese is perfect for parties! Creamy, light and fluffy, consisting of only 3 ingredients and takes only 3 minutes to make! Combine cream cheese, marshmallow fluff, yogurt and a pinch of salt in a medium-sized mixing bowl. Use a handheld mixer on medium-high speed or a whisk to combine the ingredients. Serve right away or transfer to the refrigerator to chill.